The music teacher has a unique opportunity and responsibility for helping students to reach this goal. Often it is the music teacher who has the most sustained relationship with students in the school environment, working with the same children throughout their experience at a school, while in other classes, their teachers change from year to year. Because of this prolonged relationship with her students, as well as the emotional and social aspects of music making, the music teacher has the chance to make an impact on a child’s life in a deep and lasting way that is distinct from the other relationships a child develops with adults in school. Like other teachers, the music teacher’s work largely consists of placing demands on students and helping them rise to meet these demands. Music is a performing art, and these demands are presented in the context of the rehearsal process. As students work with their music teacher over a prolonged period of time, they become accustomed to this process as they apply it to a constantly expanding repertoire, which is carefully chosen by the teacher to present appropriate new challenges, and to develop their musical and technical skill sets, their knowledge and understanding of the art form, and perhaps most importantly, their own awareness of themselves as artists, as human beings, and as learners. A music teacher is initially aided in this process by the impression that children often hold that music-making is “fun” and somehow more attractive to them than some of the other subjects taught in school. 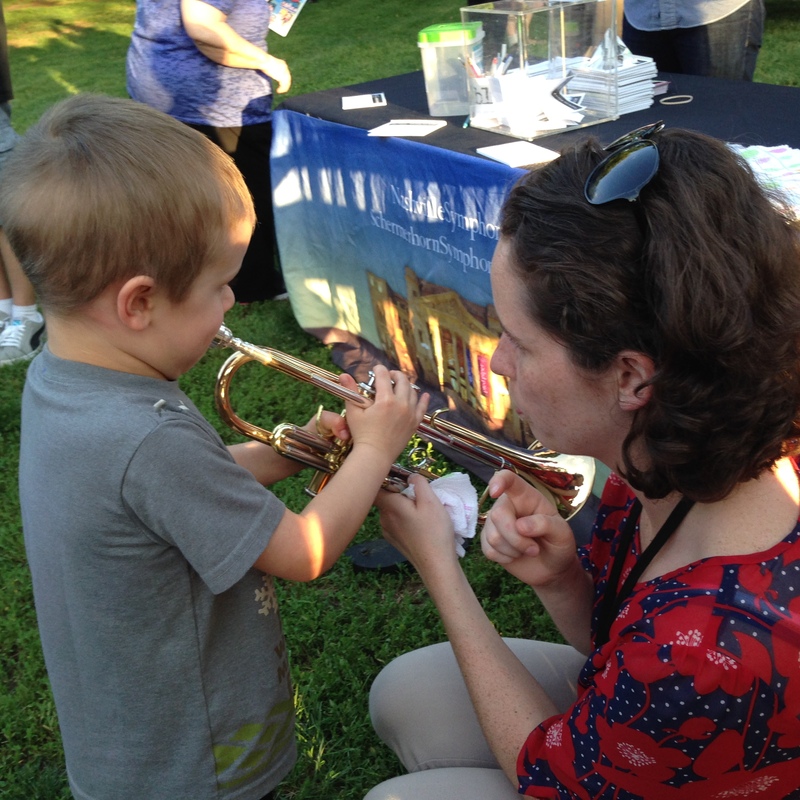 To be sure, a music program that is taught well will provide many joyful experiences for those who participate. 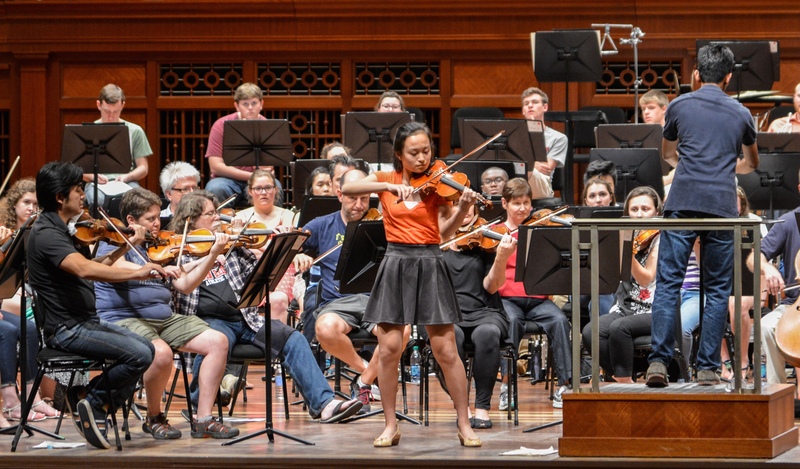 But inevitably, in a program that aspires to the pursuit of excellence on the part of teacher and students, the moments come in which the rehearsal process – or the required practice to be done outside of rehearsal by all participants – is no longer fun: it’s work. If the material under study is well-chosen, it will present appropriate challenges at every step along the way for students – and these challenges will become more difficult and require more time and effort to master as the students mature and become more accomplished. Young children learn initially through imitation, and to an extent, even as they mature and become able to learn in other ways, imitation remains a primary mode for acquiring new skills even for adults. (Just peruse the countless “how to” videos on Youtube if you need evidence to support this assertion.) 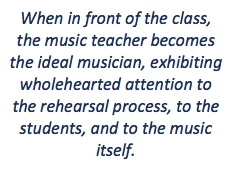 The demand on the music teacher to provide a model of how to be a musician is relentless: in any given class students present a range of cognitive development that only begins with the ability to learn through imitation, and although older students will need instruction that challenges them to think and learn in new ways, the instinct for imitation on the part of students does not relax. When in front of the class, the music teacher becomes the ideal musician, exhibiting wholehearted attention to the rehearsal process, to the students, and to the music itself. The teacher cannot demand the same intensity of work from the students without demonstrating it herself in a manner that is perceived by the students as beyond their current abilities. In this way, the teacher’s example becomes a concrete model of the kind of behavior the students are trying to accomplish – what they are imitating – that they carry with them not only as something to hold their own efforts up against when they are practicing on their own, but ultimately, as the kind of person they wish to become. What allows the teacher to continuously increase the demand she places on the students, thereby increasing their abilities to sustain the work in the classroom for longer periods of time, with more intensity, and meeting ever-greater musical and technical challenges, is trust. The trust that a child holds in her teacher is the foundation of all the work in the classroom. This is true in any classroom setting of course, but it is particularly vital and powerful in the case of the music teacher due to the sustained relationship a child develops with the music teacher over a longer period of time than with most other teachers she will encounter in school. The teacher earns this trust over time, through daily demonstration of her competence as a musician, dedication to her craft, skill as a teacher, and through her demonstrated care for her students as people as well as in her regard for them as aspiring musicians. Through repeated iterations of the rehearsal process resulting in successful performance, the student’s trust in the teacher becomes more profound and this allows the teacher to place ever greater demands on the student, thereby helping them rise to new heights of accomplishment. In a long-term relationship built on trust, the student who learns how to sing in a choir or play an instrument in a musical ensemble makes slow and steady progress towards a distant goal, mastering a complex web of skills to arrive at a specific result. Through repeated experiences of this process, the student gains not only the skills necessary to accomplish the goal of excellence in performance, but a self-knowledge and understanding of their own learning process. Through imitation on her own of the process she is led through daily in music class, the child becomes able to enact this process on her own, gradually weaning herself from the need for the teacher to lead the process as she matures. An adult who has been through this demanding experience as a child gains a secure understanding of her own abilities not only as a musician but as a learner, and is able to apply this experience and process confidently to any field of endeavor to which she gives her wholehearted attention. By walterbitner in Music Education, Philosophy on June 23, 2015 . This is a well developed piece and an excellent companion to previous posting. You may find that you want to collect these pieces and publish a book.